Last night, President George Bush addressed the nation, in an attempt to explain the current financial crisis and to build support for the administration’s $700 billion bailout proposal. In the address, Bush said that the crisis began after “a massive amount of money flowed into the United States from investors abroad because our country is an attractive and secure place to do business,” which led to easy credit and then to the housing bust. Bush, though, left out a large part of the equation. The problem isn’t simply that too much foreign investment came into the U.S. because of businesses. It’s that the U.S. had to borrow money from foreign nations at an alarming rate, after it dug itself into debt paying for the Iraq War while cutting taxes. This, as well as lax regulation and oversight of Wall St. on the part of the administration, contributed to the credit troubles. A significant reason for the current $9.6 trillion federal debt has been the Iraq War. And while the Bush administration has been spending $12 billion a month in Iraq, it’s also been cutting taxes. The Center for Budget Policy and Priorities (CBPP) says Bush’s tax cuts accounted for 42% of the “unprecedented” explosion of the deficit in recent years, which of course adds to the debt. The total cost of the full cuts amounts to about $400 billion per year. 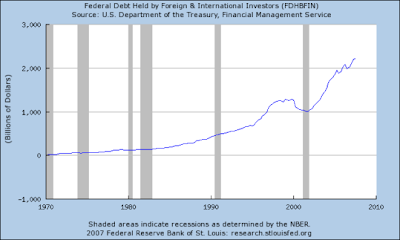 Thus, the U.S. had to turn to foreign investment for financing. Currently, 45% of U.S. Treasury securities are owned by foreign nations, with the most owned by China and Japan. Other nations owned less than 20% of these securities as recently as 1994. Bush simply left out of his assessment the fact that much of the foreign investment went to finance a war and tax cuts that couldn’t be paid for.